Tencent renamed Soso Maps, its mapping product, Tencent Maps and released new features, including in-house maps and group-buying service, today. Soso Maps was developed by Soso Search team at Tencent. Earlier this year Tencent made a strategic investment in Sogou and decided to merge Soso Search into the latter. Now Tencent Maps offer APIs for Web services and SDKs for mobile apps. WeChat Official Accounts can add map features to their accounts with the SDKs. Tencent was one of the first in China that used camera car to collect images and built a Google Street View-like service in late 2011 (It also adopted some data from City8). An API for Tencent Maps Street View is available for web services and WeChat Official Accounts. Baidu, the Chinese search giant who owns one of the most popular mapping services in China, announced to build a street view product too earlier this year. Mapping service is considered a must-have for large Chinese Internet companies as mobile Internet has been explosive and location-based service seen as the next big thing. Every player wants its own mapping site&app to become the one that users would turn to to search for nearby shops or make orders directly on a map. Baidu already has a widely adopted mapping service. 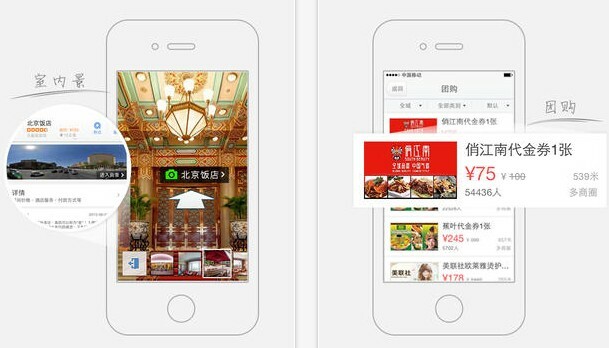 Baidu Maps has already been capable of returning nearby cinemas and restaurants, and showing group-buying deals. The company acquired a 59% stake in Nuomi, the group-buying service developed by Renren. Alibaba became the biggest shareholder in AutoNavi, a long-time map data provider and newcomer in consumer-facing mapping service, after an investment made earlier this year. Later on AutoNavi Amap app, a free mapping service, added features to enable users to reach offline merchants, such as taxis and restaurants. Alibaba and AutoNavi together launched a platform for third-party developers to use its mapping data or other offerings.